Special Agents Fangs and Puppy are on a mission, there have been a spate of robberies connected to the mysterious wizard, The Great Disgusto, and they must find him and catch him before any more happen. Unfortunately though, the Great Disgusto is good at hiding and has a secret weapon that none of them expect. Can they manage to acquire the target before too many more crimes happen and without destroying everything as they are prone to do! This was really, really funny. I loved every minute of it, though unfortunately there weren’t many minutes as its only 144 pages, however I think it is perfect for the age range its aimed at and I am definitely going to recommend it to friends with kids! The story is pretty basic but you kid of expect that from a book like this. The entertainment lies elsewhere really but I still enjoyed it. It follows the two special agents as they try and catch the bad guy, who happens to have a secret weapon… thats where the story got even more interesting and funny! I loved the addition of the secret weapon but don’t want to share too much at the risk of spoiling things for anyone planning on reading. The way Operation Golden Bum is written is what really made the book stand out. I was glad of the narration swap at the beginning of the book, it starts as third person then from the second paragraph to the second to last its all in first person from Puppy Browns point of view. I wasn’t that impressed with the third person bits and felt the first person flowed better. The humour and wit in the story was brilliant though and whilst some bits made the older part of me inwardly grown, I couldn’t help but giggle! Kids will absolutely love it. 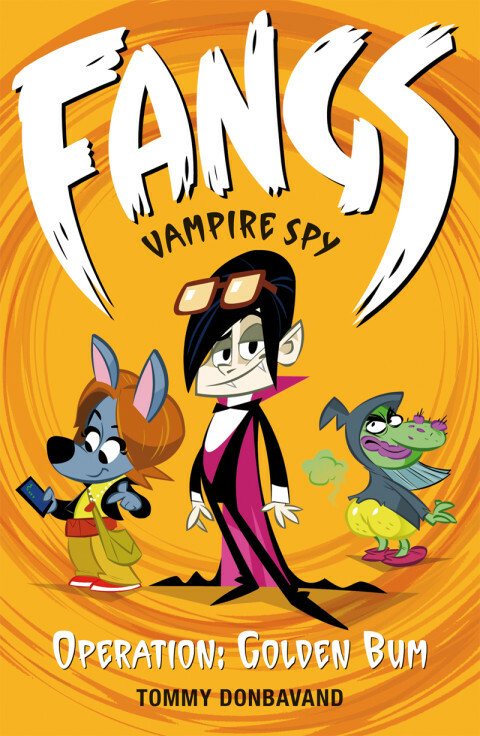 Coupled with great pictures and a level of humour that adults will enjoy as well as kids I think this book would make for a great bedtime reading activity, whether you’re reading it to your kids or they are practising reading on you; Fangs Vampire Spy is a series to watch out for! Operation: Gold Bum is the first in the Fangs – Vampire Spy series and was published on September 5th by Walker Children’s Book. My copy was gifted to me at a Walker Roadshow event.